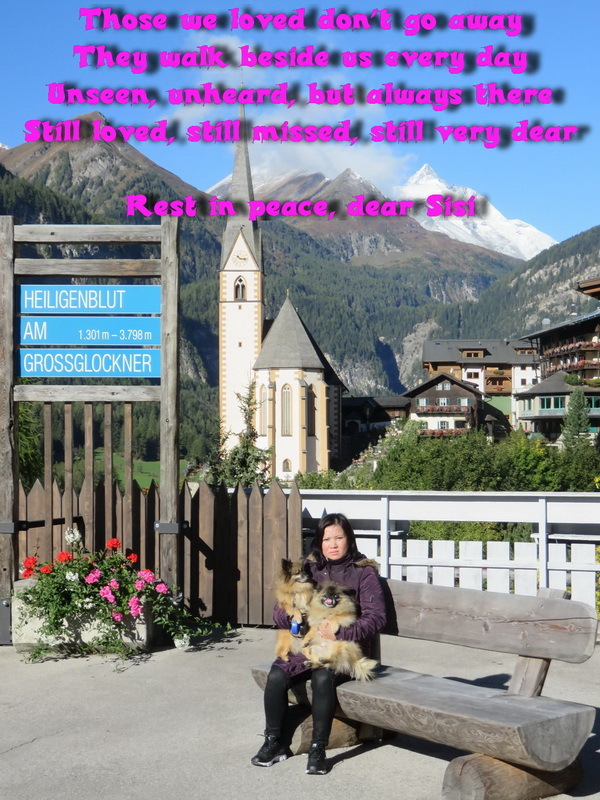 Click here if you want to go to Thi Chau's in Memoriam photo album to see the pictures. It was the family's wish that Thi Chau was to be placed in their family cemetery in Dai Trach commune, Bo Trach district, Quang Binh. Click here if you want to see the pictures of the funeral ceremonies in Vietnam. The albums contains pictures that can arouse emotional reactions. 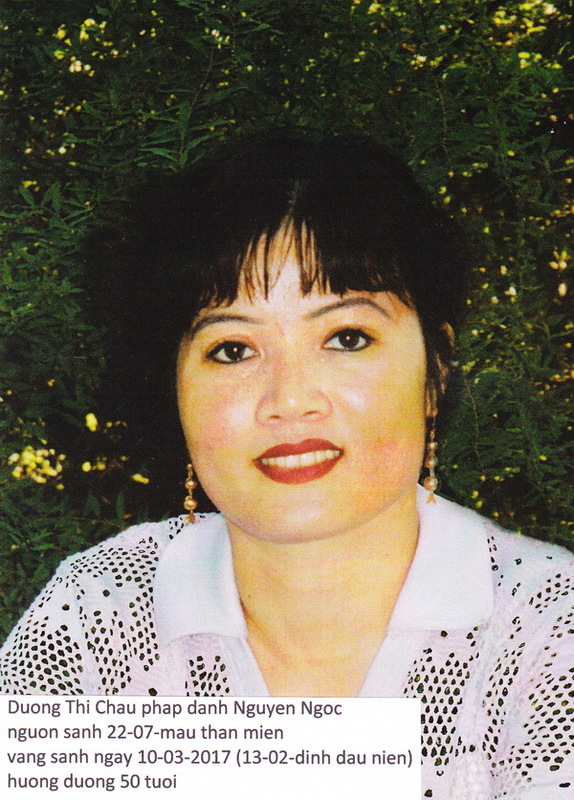 Sisi or Thi Chau, her Vietnames name, arrived on a cold day in December 2016 in the Netherlands to live with her husband Willem-Jan, followed by her son Yeri a few years later. After a year on the language school, where Sisi already made a few friends for live with some of her classmates, she found all sort of jobs in warehouses and offices. And then already hardworking and trying to help everyone that had a problem. After a serious hernia surgery in 2013 Sisi started her own nail studio. She really enjoyed the work and the contact with her customers and some of them became more than customers, they became friends. Sisi also dedicated herself to Buddha. 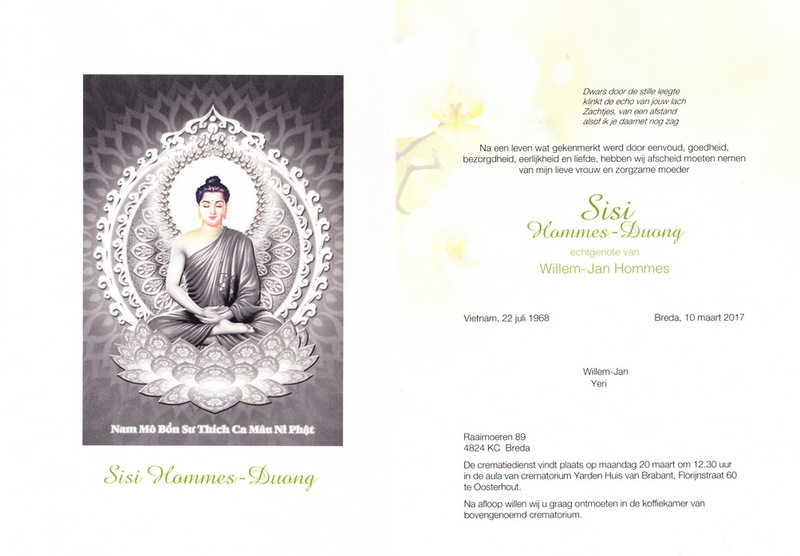 She did not only organize happenings in Breda, but also supported a few small temples in south of Vietnam and Hué. Sisi was always full of plans, such as visiting Sri Lanka to see some relics of the Buddha, going on holidays in Europe or going back to Vietnam to live there with her husband, but Buddha had apparantly different thoughts about this. Sisi died, after a severe stroke a day earlier, on Friday 10th of March at 23:08 at the Amphia hospital in Breda, surrounded by her loved ones. Sisi has finally found her rest and peace that she was not able to find here in this world. Sisi will always be remembered as a very nice and warm person, always trying to help those in need, so please, light a candle or an incense stick for her every now and then, no matter where you are.